Some of the new NDP candidates. With a slate of candidates mostly comprised of newcomers to politics, Chairman of the National Democratic Party (NDP), Hon. Myron Walwyn said that this is no doubt a new generation of NDP, who will help with new ways of governing. “…That the Territory will have a new National Democratic Party contesting the upcoming general elections. The mantle of leadership has been passed to a new generation. More than half of our candidates are newcomers to politics, but they come with a wealth of experience in various areas,” he said on radio last evening, December 3. “They have a profound love for these Virgin Islands and we look forward to bringing new energy, new ways of governing and new ideas to resolve the challenges we face as a Territory. I will be presenting our full slate of candidates following the Christmas holidays,” he added. The NDP administration has been accused of lack of accountability, transparency and poor handling of the Territory’s finances. The opposition has also labelled the party as the most corrupt government in modern history. Since Hon. Walwyn won the chairmanship of the party back in June, a movement started which saw the breakaway of some members and the formation of a new political party headed by Hon. Ronnie Skelton. Skelton had contested the internal elections for the position of chairman. So far, despite the departure of some members, including elected representatives, the NDP has most of its candidates. Only districts 1 and 2 have to be filled. The slate so far are in district 3–local rapper and educator, Mr. Aaron Parillon; Hon. Mark Vanterpool, Minister of Communications and Works-district 4; former Virgin Islands Party (VIP) 6th district candidate, Mr. Elvis Harrigan-district 5; Hon. Alvera Maduro-Caines-district 6; Hipolitio Penn-district 7; Hon. Marlon Penn-district 8; and Hon. Dr Hubert O’Neal-district 9. For the At-Large slate, Hon. Walwyn; Principal of the Elmore Stoutt High School, (ESHS), Sandy Underhill; Chairman of the Festivals and Fairs Committee, Mr. Trefor Grant; and Deputy General Manager of the BVI Electricity Corporation, Mr. Henry Creque. Walwyn spoke to the members who left the NDP, expressing that he is disappointed in their move. He said that following democratic internal elections in June, a few members resigned from the party, and to say that he is disappointed in their actions is an understatement. “However, I wish all of these individuals well on their journey as we all take part in a contest of ideas to improve the lives of the people of the Virgin Islands. Meanwhile, the business of the NDP and our Territory marches on,” he continued. The At Large Representative said that it is his intention and determination, as the new leader of the party, to ensure that it forges ahead, providing opportunities for greater inclusion and diversity of thought, so that as a party, they are truly representative of who and what they are as Virgin Islanders today. “While some wanted to close the book on the National Democratic Party, this phase simply marks a new and more engaging chapter,” he stated. The new Chairman said that he still believes that the NDP is the best hope for the Territory. “Eight years ago I joined the National Democratic Party because I believed then and even more so now, that the NDP remains the best hope to secure a productive future for the Virgin Islands and for our people,” he asserted. He said during the upcoming election campaign, the NDP will be coming to the people of the Virgin Islands with a vision of continued transformation and modernization of the Territory, by and for the people of these Virgin Islands. “The next general election, which we now know will take place by April 16th 2019, represents a watershed moment in our history,” he said. Look at all the Leaders? Who is the most hardworking person. Let us not be blinded by emotions but by who is capable of carrying the country forward. All old party candidate NAMES were tarnished with some form of corruption. Some moreso than others. None of them squeaky clean.The country would go on. Vote your conscience, vote who has the country at heart, vote who reach out to all indigenous and expatiates alike. Better ! Stronger together! Division will destroy this country if We do not work together. The young new comers for that party, represent the NEW FACE of the BVI. WAY TO GO!!!! Hip Hip, but no hurray. This is the same man who as he admit was with NDP 8 years. No sir, Flood and hurricanes did not put us where we are in this lowest ebb, but instead, flood and hurricanes were a blessing in disguise. They actually brought us to an awareness of what was in the dark with the NDP government, all of you new, reformed, movement or otherwise. You planning to reveal and present your slate after Christmas, but my question is, when are you going to audit our accounts to bring them to current so that we can see what the state of affairs really is?? How do you intend to go to an election, new as you seem to think, without the accounts being audited so that we the people can see and know where we are heading in broad daylight economically? All of you NDPians, it does not matter what shape or form or color or speech or psycology you all come with, You are still those "honorable" men who owe us the respect to tell us about our accounts, transparency, accountability and good governance. Until then! The man from the 1st speaketh. Yes, we need the audited accounts completed and presented to the people. IF YOU WANT TO KNOW THE TRUTH IN POLITICS, YOU SIMPLY FOLLOW THE MONEY! Why do you think it is a joke? All parties will be new. They all have new candidates amongst them, they all will be led by different leaders. The Old VIP made many mistakes, in which the old NDP turn around and got fix, yes they now made some mistakes but because some of you ain't get your house rebuild with government money you all vex. For the last few weeks, everybody just on Myron as though he is to be perfect. 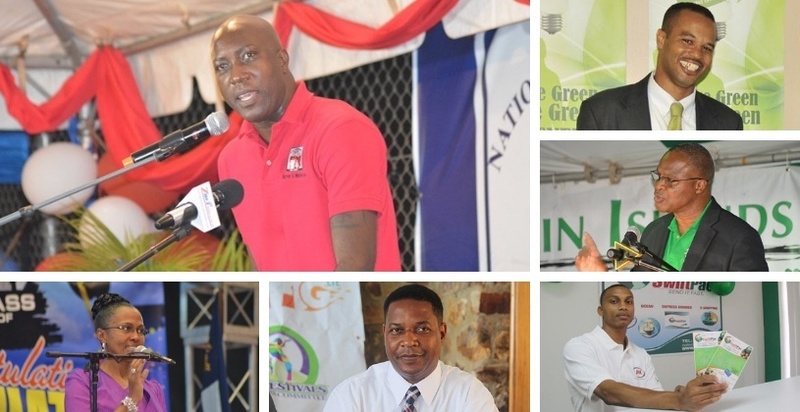 What I want to hear is what these leaders and candidates plan is for the BVI. You have to listen to each candidate and make your decision. Nobody tell you you have to like him. What you need to understand who will lead proactively and has the best team to support them nationally and internationally. How many of us like our boss? I am sure not many. Yawnnn @ VI 2 De Bone It ain't about who aint get their houses fixed. The problem was and still...NO ACCOUNTABILITY...NO TRANSPARENCY. Point blank. Even with a new team, the leader is the same person who sat in the house day in and day out and never said "WE NEED TO GET THESE THINGS AUDITED" or even "RESPECTFULLY, THIS IS WRONG PREMIER. So what is he going to tell me so i can vote for them? That they change?? HA! April fool joke indeed.